Spreading depolarizations (SDs) occur in 50–60% of patients after surgical treatment of severe traumatic brain injury (TBI) and are independently associated with unfavorable outcomes. Here we performed a pilot study to examine the relationship between SDs and various types of intracranial lesions, progression of parenchymal damage, and outcomes. 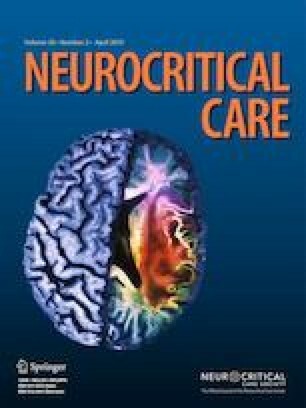 In a multicenter study, fifty patients (76% male; median age 40) were monitored for SD by continuous electrocorticography (ECoG; median duration 79 h) following surgical treatment of severe TBI. Volumes of hemorrhage and parenchymal damage were estimated using unbiased stereologic assessment of preoperative, postoperative, and post-ECoG serial computed tomography (CT) studies. Neurologic outcomes were assessed at 6 months by the Glasgow Outcome Scale-Extended. Preoperative volumes of subdural and subarachnoid hemorrhage, but not parenchymal damage, were significantly associated with the occurrence of SDs (P’s < 0.05). Parenchymal damage increased significantly (median 34 ml [Interquartile range (IQR) − 2, 74]) over 7 (5, 8) days from preoperative to post-ECoG CT studies. Patients with and without SDs did not differ in extent of parenchymal damage increase [47 ml (3, 101) vs. 30 ml (− 2, 50), P = 0.27], but those exhibiting the isoelectric subtype of SDs had greater initial parenchymal damage and greater increases than other patients (P’s < 0.05). Patients with temporal clusters of SDs (≥ 3 in 2 h; n = 10 patients), which included those with isoelectric SDs, had worse outcomes than those without clusters (P = 0.03), and parenchymal damage expansion also correlated with worse outcomes (P = 0.01). In multivariate regression with imputation, both clusters and lesion expansion were significant outcome predictors. These results suggest that subarachnoid and subdural blood are important primary injury factors in provoking SDs and that clustered SDs and parenchymal lesion expansion contribute independently to worse patient outcomes. These results warrant future prospective studies using detailed quantification of TBI lesion types to better understand the relationship between anatomic and physiologic measures of secondary injury. The authors thank Claus Holst at Frederiksberg Hospital, Copenhagen, Denmark, for statistical advice and Dr. Achala Vagal at the University of Cincinnati Medical Center, OH, USA, for radiologic guidance. NE performed stereologic assessments, analyzed data, and drafted the manuscript. BP and ER conceived the project, advised on design and methods, supervised CT analysis, and edited and approved the manuscript. DOO, DM, LAS, AJS, JW, and CP recruited subjects into the study, provided associated data, and edited and approved the manuscript. JPD performed data analysis, contributed to writing and interpretation, and edited and approved the manuscript. PM performed the primary statistical analyses and edited and approved the manuscript. MJL conceived and supervised the project, and edited and approved the manuscript. MF performed data analysis, contributed to writing, and edited and approved the manuscript. JAH recruited subjects into the study, organized data, prepared figures, and drafted and approved the manuscript. Research was supported by the US Army CDMRP PH/TBI Research Program (Contract No. W81XWH-08-2-0016), the Agnes and Poul Friis´Foundation, the Aase and Ejnar Danielsens Foundation, the Dagmar Marshall’s Foundation, Deutsche Forschungsgemeinschaft (DFG DR 323/5-1), Bundesministerium für Bildung und Forschung (BMBF CSB 01 EO 0801) and FP7 No. 602150 CENTER-TBI.